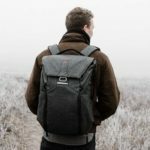 While backpacks have traditionally been identified as school and travel gear, they have found a new place on the modern man. This is now a style essential where you can throw in all your crap and bear the weight on your shoulders. It leaves your hands free and keeps your body’s stance. Whether you want the most inexpensive buy or a stylish, sleek design from the best designers, here’s where you’ll find it. 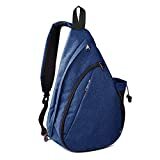 The best men’s backpack will have a color you love, with the right number of straps and buckles, plus it will have the capacity for all your essentials. Designed to store electronic accessories, the Nelson Backpack by Herschel Supply Co. is what every modern guy wants on their shoulders. It comes with a large, easily accessible front pocket, complemented by two sturdy zippers. It secures fast to ensure accessories are well-protected. You’ll love that the leather zipper pulls which showcase the longevity of the closure system. This means they’ll not come off unexpectedly when you are in a hurry to leave. The contoured style comes in handy to ensure that the weight is well-distributed on your back. It is 18.5inches deep meaning it has the capacity to carry laptops up to 17inches long. Not to mention, the bag itself weighs only 1.3pounds. It will never feel like a drag when you wear it for long hours. Spring is the time we get to showcase new styles. This backpack is a timeless piece to grace all seasons. It’s available in two colors, and it enjoys a construction from polyester. This fabric wicks away sweat so that you’ll not feel all heated up in your back. Just try it out because it will not cost you an arm and a leg. From the legendary work apparel experts, Carhartt Legacy is a backpack with all the perks of a classy piece. Let’s start with the 1200denier polyester construction. It is water repellant thanks to the tough rain defender in the lining. It also showcases an impressive Duravax base which is abrasion resistant. The main compartment comes with a laptop-dedicated pocket. It is padded to ensure the laptop arrives in one piece if the bag encounters a bump in the road. You’ll also love the numerous pockets where you won’t be in a fix as to what to include in the bag and what to leave out. You can take it to school, trekking, and even casual work days. With the contour fit strap shoulders, they’ll never dig into your skin. It has a mesh panel to keep the air flowing between your back and shoulders. It ensures you are comfortable even when walking under the scorching sun. North Face is another famous company well known for their hiking and backpacking footwear. The main compartment is padded just like the Carhartt Legacy. 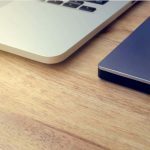 It will also secure your laptop for safe transport. The making of this backpack is from 600D polyester. It is strong and sturdy such that the bag will last in excellent condition. The secondary pocket comes with internal several organization pockets including a Velcro pocket, zipper secured pocket, and pen pockets. It is your go-to for business travel as well as weekend meetings. The compression molded shoulder straps are molded to sit right without excessive pulling. It comes with an air panel and a spine channel to increase the balance and support of the backpack’s weight. Every color choice of the North Face comes with a 360-degree reflective panel. If you are going to be riding a bike wearing this backpack, other motorists can see you from a far distance. The other impressive feature of this bag is the water bottle pockets. You’ll no longer have to haul the whole bag in front of you to take out a water bottle. The side pockets work the magic. KAUKKO backpacks have been college essentials for a reason. It is functional, with large capacity and well organization. It boasts a 600D polyester material on the exterior and a nylon lining on the insides. 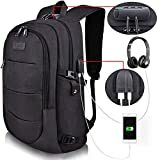 This backpack qualifies as an upscale bag which is a staple when carrying delicate items like your 15inch laptop. The bag is not only water repellant, but it is also abrasion resistant. You’ll find it comfortable to carry throughout the day. This is thanks to the padded shoulder straps that are length adjustable to accommodate the various needs according to the weight. We love that it comes with a small clutch bag where you can store pencils and other small essentials. The front pockets have adjustable drawstrings. They secure the bag to ensure nothing falls off from the sides unknowingly. It is a cool tool that finds itself on campus hallways and even wandering the wide streets. The vertical stripes showcase a stylish design which goes with the color of the bag of your choice. Featuring a minimalistic design, the Vaschy is a backpack that focuses on simplicity. Not to say the materials are of less quality. In fact, it brings in a high-quality waterproof polyester exterior. It’s just the right pick for the cold winter months where you need your hands toasty in your pockets. The main compartment comes with a double zipper closure. With the help of the leather pulls, you’ll no longer have pinched fingernails. It comes with an exterior pocket and padded laptop pocket which can also fit tablets, iPads and other fragile items. The two side pockets are ideal to put a water bottle so you can keep refreshed on the go. There’s plenty of room for either your notebooks or grocery shopping. It is ultra strong and resistant to shrinking even after frequent washes. The back is fully padded to give optimum comfort to your back. The straps are also padded and adjustable to help achieve a custom fit. With the top strap, you get to carry the backpack in an upright position in case the train is densely packed. The Everest Luggage Backpack offers the best bang for your buck. It takes on a travel design with a large front pocket to store over 20 pounds of luggage. With a construction from 100%polyester, you can already tell this backpack is of high-quality. The front pocket organizer will take on virtually everything you need for a long backpacking trip. 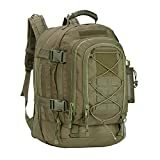 It is stuffed with pockets for water, maps, phones and other outdoor essentials. It has side mesh pockets and an upper mesh panel to store items you want to reach in a moment’s notice like a flashlight. Better still, the lumbar wicking panel will keep you free of sweat and heat accumulation. It is admirable that the Everest is machine-washable. It provides simple care and maintenance so it will always be ready for travel. It does not come with any unnecessary buckles just one hanging strap that can work as a carry handle. It does it for air travel and long road trips the same. If you are just meandering around the park, you don’t need a heavy backpack. A small crossbody backpack is better positioned to meet the small needs at such times. OutdoorMasters presents a sling bag that is compact and lightweight. It is spacious and also fit for carry-on luggage. It boasts a polyester and canvas construction making it ultra-light. The main compartment is enough for a day’s supply. It comes with a padded pocket that can fit a 12inch laptop. It also has an anti-theft pocket, smart organizer, and a water bottle holder. The sling provides an easy carrying method so you can still take other items. There are many color options which make it easy to spot it in a crowd. You’ll never leave it behind. The affordable pricing means you get to spend less on supplies and enjoy a plentiful trip. Not to mention, it is collapsible, so it easily stores in other luggage. Let’s just say, OutdoorMasters has the lightest option in men’s backpacks. The JanSport backpack draws from a classic design dedicated to laptop security. It comes with a thick, padded front pocket which secures laptops measuring 15inches. This laptop sleeve is sound enough such that any delicate accessory stored is always safe. This backpack combines top-grade elements in its making. The top exterior is from 915 Denier, Cordura fabric. It enjoys superior durability since Cordura is a type of denim which is tear-resistant. The base is from leather, another sturdy material. It resists wearing from being on hard floors or trekking through rough vegetation. This backpack is super easy to carry. It comes with a haul handle and padded shoulder straps. The straps are adjustable, and there are no extra buckles to hassle. The back panel is also quilted so anything you put in the bag will not press against your back. Plus it is designed to sit upright every time it’s on the floor so no spills from stored liquids. The Fjallraven- Kanken Classic Pack, has your back. It’s been here since 1978, and they definitely know what to include in an iconic men’s backpack. This bag is stylish and made from attractive materials. It is dirt and water resistant thanks to the Vinlyon F fabric. It can be wiped clean every time it catches dirt so no need to machine-wash it severally. 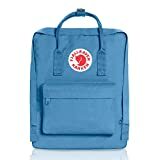 The functionality of the Kanken comes with the 16liter volume which means it can accommodate most of your accessories. It can even take 15inch laptops as it also includes a secure sleeve. You’ll like the two-way zipper which comes with a rain flip to keep out water. The backpack also comes with a content information tag that adds to the personalization. We love that this backpack is ergonomically designed. The side pockets are easily accessible, and the shoulder straps are woven to make an X. It has dual top snap handles which allow for carrying the bag on the hands in crowded places. An incredibly fashionable item in the business world is the Mancro Anti-theft Backpack. It is designed for the busy man who needs to take their work with them wherever possible. This backpack offers the best security for laptops under 17inches. The laptop space is unique since it stays hidden in plain sight. With three main pockets, you have more than enough space to store business materials along with clothes if you are using the bag for business travel. It has nine inner pockets and two side pockets. The metal zippers come with a theft-proof combination lock where you can keep all valuables secure from people who like invading personal property. Apart from the safety, you have a backpack that has a built-in charging cable. If you have a portable charger, your devices can charge conveniently in the bag. 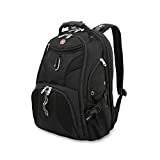 It is the perfect travel backpack for day-long outdoor adventures and daily life. The nylon fabric is water repellant and lightweight for effortless carriage. Backpacks for men are diverse to meet the different styles. That’s why it’s necessary to know what to look for. As we’ve covered the top performers, we hope that one of them satisfies your needs. 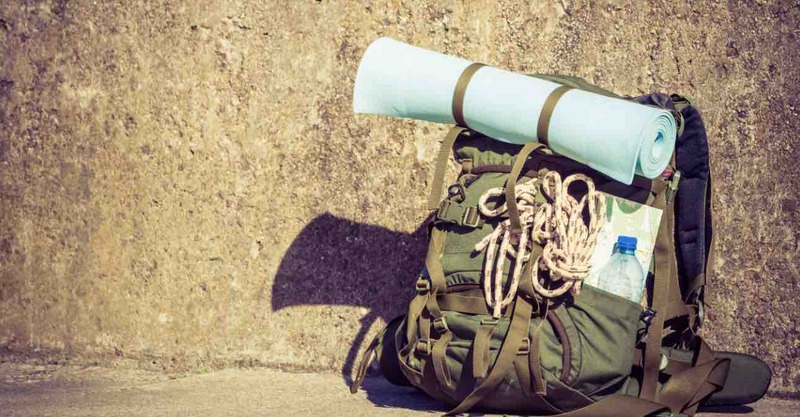 These backpacks are made from the best materials. They have ample space and rate well for the price. Pick your model to enjoy everyday life with a backpack.